By now you’re probably already sick of 2019 and waiting for the day you will have 2020 hindsight and everything will make sense. Serene Dominic feels your ennui and that’s why Onus Records is launching the Serene Dominic Countdown to 2020 series. Each day he will post a random song from his Onus Records back catalog picked at random and add any pertinent information about it that will allow you to download it and purchase the album it happens to land on. When possible we will also add a video link to view as well. In doing this together, maybe we can all countdown to a more knowledgable future, at least where Serene Dominic is concerned. We also will keep releasing Singles of the Weekend when new ones are made available and every Wednesday will be feature a different video of an Onus Recording artist for “Video Vednesday,” an admittedly stupid name for a recurring post that only Zsa Zsa Gabor would not flinch at. Serene 20/20 Self-Analysis: “People love to muse about the first thing they would do if they ever came into a lot of money or won the lottery. Before 2009 my answer was always the same, have a home recording studio. I never amassed a fortune either way, but that year, I had a decent enough tax return to buy tax return to buy a good microphone and a used MacBook with Garageband on it and that’s how I recorded Unnatural Blonde, a song cycle based on the 1958 movie classic Vertigo which later became the first musical I ever wrote, Swimming in the Head. “Spring” and “release” are two words that make San Jacinto Prison Band’s lawyers take notice but in this case it means Onus Records is readying two new CDs for April, San Jacinto Prison Band’s sophomore effort Unfreedom Rock and World Class Thugs long-awaited (8 years in the making) third album Southwestern Dirt Circuit. With overlap of personnel in both bands it made sense to combine forces for a CD double CD release show at Chopper John’s April 26 with special guest Fatigo. Fear of Suge Knight retribution led them to drop “Death Row” from their name but these melodious felons still perform each song as if their life sentence hangs in the balance. Last year, bandleader Serene Dominic assembled the sextet to be the pit band for his musical Dark Lullaby. The band adopted nine of the show’s songs as their live set which made the balance of their first CD, Sing Dark Lullaby. “We learned the Act One songs from Dark Lullaby first and later learned and recorded the balance of the show for the cast album, ” Dominic says. “A lot of those Act Two songs turned out to be some of the best things we’ve ever done, so we decided to make them part of a new album instead of a standalone EP. Filling out Unfreedom Rock are new versions of four older Serene Dominic songs and two brand new ones written specifically for this band — “Conjugal Visit,” which demonstrates the band’s flexibility to stray into rock-jazz territory, and “Testosterone,” an odd tribute the disco-era Bee Gees which contains falsetto and false bravado in equal measure. futuristic imagery and men in stripes trying to find a place in the world of tomorrow. Muses Dominic, “It’s a happy song about the future for a change and I hope the video reflects that. Click here to stream Unfreedom Rock! Click here to see the band’s hippie co-opted “Unfreedom Rock” commercial. Why did this record take so goddamned long? In the time that it would conceive and raise an 8-year-old, World Class Thugs looked after their own collective spawn and spun off into some side projects (Jim Dustan in Psycho Square Dance and San Jacinto Prison, Jim and Jocelyn Fox in RPM Orchestra), all the while woodshedding this collection of tunes about drug fueled years, trazodone men, red eyes and crazy quilts. The long awaited follow-up to their second CD, Curio, sounds very much like the carnival has come to town with some delightful delicacies, a couple of suspect rides and a few sideshow attractions that have gone to seed. New members to the thug life include Trent Morue (Vinegar Sting, Haunted Cologne) on bass, Andrew Jemsek (Moonlight Magic, San Jacinto Prison Band, Haunted Cologne) on keyboards and accordion and Carter Dukarm (Zany Guys, Psycho Square Dance) on pedal steel. Click here to stream Southwestern Dirt Circuit. Click here to view the new video for “2791 (a new delivery system)”! “The proof is in the vegemite,” said singer Geoff Thatcher, grey sideburned and visibly hot under the collar. “We released our “Strength Was Always Your Weakness” in May of 1967.” From out of his liquor cabinet, he pulls his dog-eared copy of the Makeup Sects’ debut 45, released on the equally obscure Fission label and he slaps it on his ancient Victrola with measured alacrity. “I mean I have kinescopes of us performing it on Teenager’s Choice,” he says about the down-under dance party show that I have to feign complete ignorance of. After an hour of waiting for him to thread the Bell and Howell project, I decided to take his word for it. So we did a lot of digging. But there was nothing in Wikipedia on them so we had to do actual digging. And we found that The Makeup Sect, if they were known for anything, it was for ripping off very well-known British bands. Errr, ONE very well-known British band. You could do a lot worse in 1966 and early 1967 than worship at the altar of the Rolling Stones and if anyone ever wondered what the music of Aftermath or Between the Buttons might have sounded like sung with authentic Australian accents, they could do no better than this quintet. Stones copyists to a man, The Makeup Sects not only purchased their orange corduroys from the same pants maker that Brian Jones did, they made sure Jones’ bangs and muttonchops were never longer than those of their rhythm guitarist Derek Linseed’s at any given time. Sometimes that emulation ate through the band’s living funds–purchasing all the exotic instruments the blonde Stone had mastered and then discarded with every new Jagger-Richard composition. “Strength Was Always Your Weakness,” a Thatcher-Lindseed original, if you can call it that. is a prime example of The Makeup Sects’ slavish devotion to the bad boys of rock—fuzz bass, ghostly Chuck Berry licks, snarky lyrics about a messed up chick and simple but insistent drumming. Had they remained true to these punky R&B roots as they did on their first album, a blatant Between the Buttons lift called Up The In-Seam, the Sects would’ve been in a very good position to usurp the genuine article, soon to abandon those very same earthy sounds for the folly of Their Satanic Majesties Request. But devotees they were to the end, following their heroes up the primrose paisley path with a disastrous psychedelic opus of their own, Demonic Renaissance Minstrels At Your Service, that all but eroded their fan base. Felled by audience disinterest and the crippling cost of the floral arrangements for the album cover, The Makeup Sects were but a grimy memory by the end of 1968. The above clip contains excerpts of their appearance on Teenager’s Choice combined with pathetic new footage shot in the Eighties, when the band’s dependency on lip-syncing and wigs became all too obvious. To stream and purchase The Breakup Society’s “Strength Was Always Your Weakness and other great Breakup Society songs, click here! How do you steel yourself against a random universe that seems determined to turn you into an accidental killing machine? SHERI AMOURR, the director who brought you such live downtown stage musicals as The Goblin King’s City, A Swimming in the Head and Rocky Horror at the Firehouse, joins forces again with SERENE DOMINIC (writer of A Swimming in The Head) to bring you DARK LULLABY, a new musical based on the 1945 film-noir classic Detour, even though Dark Lullaby’s story arc goes from the mid 1970s to the late 1980s, leaving plenty of room for stylistic musical genre-hopping, from rock to rap to disco to filter in. Writer/co-director SERENE DOMINIC narrates as the older more incarcerated Tom while the SAN JACINTO DEATH ROW PRISON BAND serve as the show’s pit orchestra. Through personal reminiscences, songs and flashbacks, we’ll follow Tom Reynolds’ unintentional killing spree across the United States. The show will premiere Saturday, June 9 at the new Trunk Space’s Hope Hall (where Catholic masses are held in its less homicidal moments). Showtime is at 8 PM. For advance ticket to this first show, click here. The second performance will be on Father’s Day night, Sunday, June 17 at The Film Bar, a natural place for a film noir musical to come full circle! Showtime is 8 PM. For advance tickets for this 2nd and final show, click here. For Serene Dominic, the music from the show has taken a few twists and turns. Originally it was an album he released in 2016 on Onus Records as he was writing the show. This year, San Jacinto Death Row Prison Band released Sing Dark Lullaby and performed nine songs from the show on it. The remaining Dark Lullaby songs will be issued on a San Jacinto Death Row Prison Band EP this fall. The band has been making club and bar appearances well before the Dark Lullaby premiere, including a CD release show at The Lost Leaf on May 18. A full cast album of Dark Lullaby featuring the voices of the actors with San Jacinto Death Row Prison Band playing behind them, will be issued by Onus Records at the premiere show at Trunk Space on June 9. Click here to hear songs from the show performed by Serene Dominic and San Jacinto Death Row Prison Band. 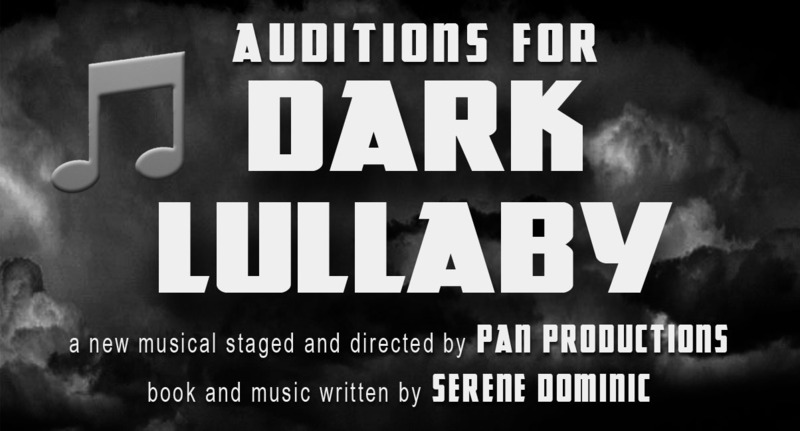 In advance of the spring 2018 Pan Production presentation of the new musical “Dark Lullaby,” Serene Dominic is releasing the album digitally in a 14-song version on September 26, 2018. The compact disc version will also contains three additional songs slated for the upcoming musical that are not being premiered anywhere else until the Dark Lullaby Cast Album comes out this spring. Serene’s first musical, “Swimming in the Head” (also a Pan Production) was originally conceived as an album called Unnatural Blonde and was then adapted into a musical format. “Dark Lullaby” was always conceived as a musical, so in a sense it almost is his first musical. In fact, says Dominic, “Originally it was my intention to record a cast album first, with different actors singing on everything, which would make for a uniquely weird album. But we’re doing it backwards now. I’ve assembled a pit band for the show that will be gigging around Arizona as the San Jacinto Death Row Prison Band right up to the production of the show. And we have a great cast who will actually put their vocals talents down on recordings before the show even goes into rehearsals.” The plan includes the seven-piece San Jacinto Death Row Prison band recording all the track and then playing them live during the production. It’s a pretty odd mix of songs for a musical that’s patterned after an old 1940s film nior classic “Detour,” but takes place in the Eighties and has flashbacks in the Seventies. The release of “Dark Lullaby” jumpstarts a season of brisk activity for Onus Records, the non-profit record label that Dominic co-runs. More upcoming releases this fall will includes new releases from The 1140s, The Breakup Society and Broken Poets, and the awaited third album from No Volcano which will appear in early 2018. Click here to download the audition scripts for 8 major roles.